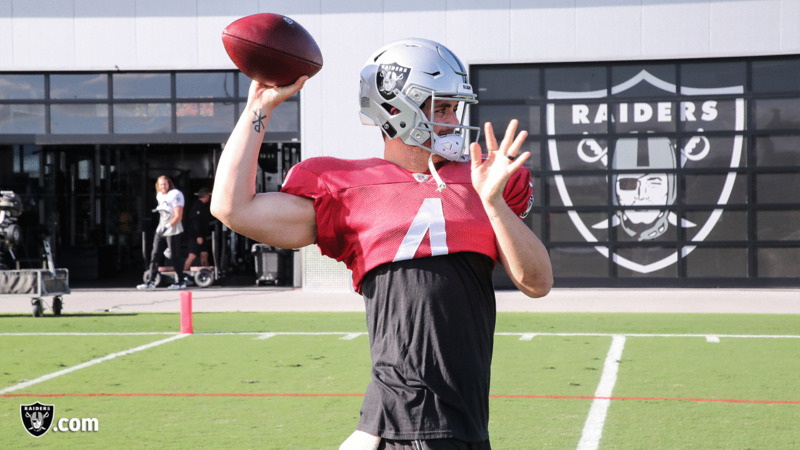 Oakland Raiders quarterback Derek Carr (4) on the field for practice at the Oakland Raiders Practice Facility, Wednesday, November 28, 2018, in Alameda, California. Oakland Raiders defensive tackle Clinton McDonald (97) on the field for practice at the Oakland Raiders Practice Facility, Wednesday, November 28, 2018, in Alameda, California. Oakland Raiders running back DeAndré Washington (33) on the field for practice at the Oakland Raiders Practice Facility, Wednesday, November 28, 2018, in Alameda, California. Oakland Raiders running back Doug Martin (28) on the field for practice at the Oakland Raiders Practice Facility, Wednesday, November 28, 2018, in Alameda, California. Oakland Raiders wide receiver Marcell Ateman (88) on the field for practice at the Oakland Raiders Practice Facility, Wednesday, November 28, 2018, in Alameda, California. Oakland Raiders safety Reggie Nelson (27) on the field for practice at the Oakland Raiders Practice Facility, Wednesday, November 28, 2018, in Alameda, California. Oakland Raiders fullback Ryan Yurachek (44) on the field for practice at the Oakland Raiders Practice Facility, Wednesday, November 28, 2018, in Alameda, California. Oakland Raiders center Rodney Hudson (61) on the field for practice at the Oakland Raiders Practice Facility, Wednesday, November 28, 2018, in Alameda, California. Oakland Raiders players and coaches on the field for practice at the Oakland Raiders Practice Facility, Wednesday, November 28, 2018, in Alameda, California. Oakland Raiders tight end Jared Cook (87) on the field for practice at the Oakland Raiders Practice Facility, Wednesday, November 28, 2018, in Alameda, California. Oakland Raiders linebacker Tahir Whitehead (59) on the field for practice at the Oakland Raiders Practice Facility, Wednesday, November 28, 2018, in Alameda, California. Oakland Raiders linebacker Marquel Lee (55) and linebacker Jason Cabinda (53) on the field for practice at the Oakland Raiders Practice Facility, Wednesday, November 28, 2018, in Alameda, California. Oakland Raiders linebacker Nicholas Morrow (50) on the field for practice at the Oakland Raiders Practice Facility, Wednesday, November 28, 2018, in Alameda, California. Oakland Raiders wide receiver and return specialist Dwayne Harris (17) on the field for practice at the Oakland Raiders Practice Facility, Wednesday, November 28, 2018, in Alameda, California. Oakland Raiders tight end Darren Waller (83) on the field for practice at the Oakland Raiders Practice Facility, Wednesday, November 28, 2018, in Alameda, California. Oakland Raiders defensive tackle PJ Hall (92) on the field for practice at the Oakland Raiders Practice Facility, Wednesday, November 28, 2018, in Alameda, California. Oakland Raiders wide receiver Jordy Nelson (82) on the field for practice at the Oakland Raiders Practice Facility, Wednesday, November 28, 2018, in Alameda, California. Oakland Raiders wide receiver Seth Roberts (10) on the field for practice at the Oakland Raiders Practice Facility, Wednesday, November 28, 2018, in Alameda, California. Oakland Raider wide receiver Keon Hatcher (14) on the field for practice at the Oakland Raiders Practice Facility, Wednesday, November 28, 2018, in Alameda, California. Oakland Raiders tight end Derek Carrier (85) on the field for practice at the Oakland Raiders Practice Facility, Wednesday, November 28, 2018, in Alameda, California. Oakland Raiders defensive tackle Frostee Rucker (98) on the field for practice at the Oakland Raiders Practice Facility, Wednesday, November 28, 2018, in Alameda, California. Oakland Raiders defensive tackle Jonathan Hankins (90) on the field for practice at the Oakland Raiders Practice Facility, Wednesday, November 28, 2018, in Alameda, California. Oakland Raiders linebacker Shilique Calhoun (91) on the field for practice at the Oakland Raiders Practice Facility, Wednesday, November 28, 2018, in Alameda, California. Oakland Raiders defensive tackle Justin Ellis (78) on the field for practice at the Oakland Raiders Practice Facility, Wednesday, November 28, 2018, in Alameda, California.  Oakland Raider guard Chaz Green (65) on the field for practice at the Oakland Raiders Practice Facility, Wednesday, November 28, 2018, in Alameda, California. Oakland Raiders tackle Justin Murray (71) on the field for practice at the Oakland Raiders Practice Facility, Wednesday, November 28, 2018, in Alameda, California. Oakland Raiders guard/tackle Denver Kirkland (79) on the field for practice at the Oakland Raiders Practice Facility, Wednesday, November 28, 2018, in Alameda, California. Oakland Raiders cornerback Gareon Conley (21) on the field for practice at the Oakland Raiders Practice Facility, Wednesday, November 28, 2018, in Alameda, California. Oakland Raiders linebacker Emmanuel Lamur (54) on the field for practice at the Oakland Raiders Practice Facility, Wednesday, November 28, 2018, in Alameda, California. Oakland Raiders strong safety Karl Joseph (42) on the field for practice at the Oakland Raiders Practice Facility, Wednesday, November 28, 2018, in Alameda, California. Oakland Raiders offensive guard/tackle Kelechi Osemele (70) on the field for practice at the Oakland Raiders Practice Facility, Wednesday, November 28, 2018, in Alameda, California. Oakland Raiders safety Marcus Gilchrist (31) and cornerback Daryl Worley (20) on the field for practice at the Oakland Raiders Practice Facility, Wednesday, November 28, 2018, in Alameda, California. Oakland Raiders safety Erik Harris (25) on the field for practice at the Oakland Raiders Practice Facility, Wednesday, November 28, 2018, in Alameda, California. Oakland Raiders tackle Kolton Miller (77) on the field for practice at the Oakland Raiders Practice Facility, Wednesday, November 28, 2018, in Alameda, California. Oakland Raiders cornerback Rashaan Melvin (22) on the field for practice at the Oakland Raiders Practice Facility, Wednesday, November 28, 2018, in Alameda, California. Oakland Raiders punter Johnny Townsend (5) on the field for practice at the Oakland Raiders Practice Facility, Wednesday, November 28, 2018, in Alameda, California. Oakland Raiders punter Johnny Townsend (5) and kicker Daniel Carlson (8) on the field for practice at the Oakland Raiders Practice Facility, Wednesday, November 28, 2018, in Alameda, California. Oakland Raiders punter Johnny Townsend (5), long snapper Trent Sieg (47), and kicker Daniel Carlson (8) on the field for practice at the Oakland Raiders Practice Facility, Wednesday, November 28, 2018, in Alameda, California.